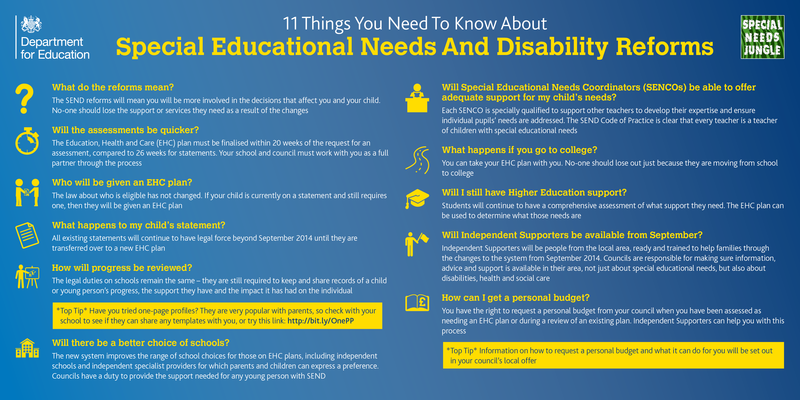 If your child has a learning disability, their 'special educational needs' (SEN) can be met either in a mainstream school with extra support, or in a special school. From September 1 2014, a new system for supporting children and young people with SEN, and their parents, came into effect. The new system aims to ensure that any support your child gets, from their school or other setting, such as their nursery or childminders, should meet their needs. Under the new system, SEN support replaces school action/school action plus (in schools) and early years action/early years action plus (in early years settings, such as nurseries and childminders). 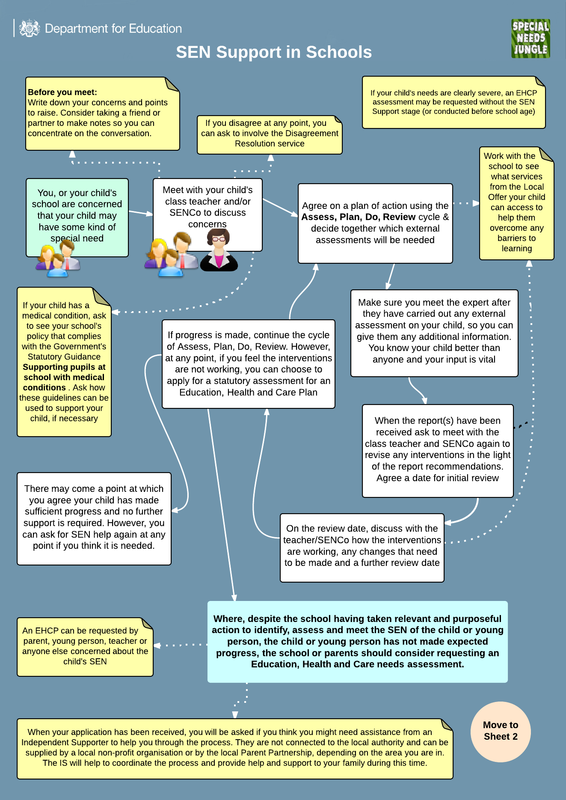 Children and young people with more complex needs might instead need an Education, Health and Care (EHC) plan. 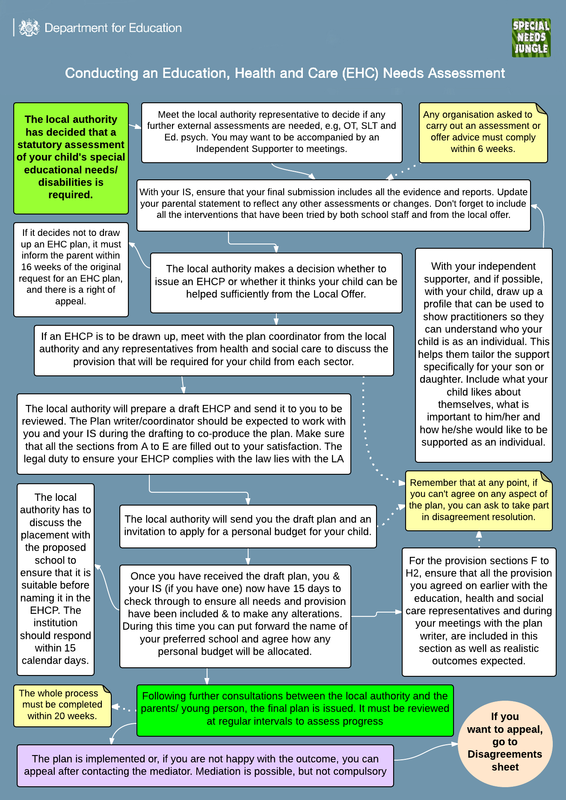 EHC plans replace statements of SEN and Learning Disability Assessments (LDAs). What happens to my child's existing statement of SEN? The definition of SEN has not changed. If pupils were previously receiving support under "school action" and "school action plus", they should continue to do so, unless they no longer need it. 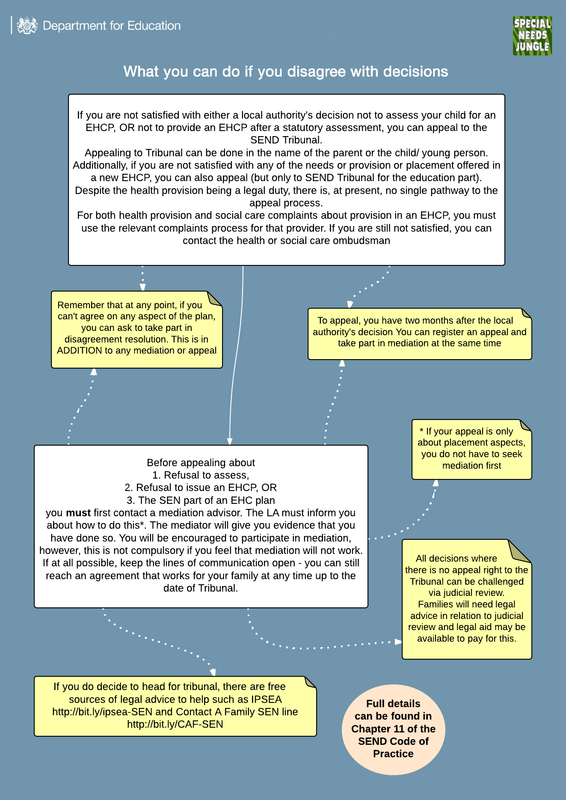 All existing statements will still apply until your child is transferred to their new EHC plan. This will happen over a three-year period. You may be contacted if your nursery/childminders, school or college think your child needs SEN support. In schools, for example, this will be by your child's teacher or special educational needs co-ordinator (SENCO). You can also approach your child's school/nursery etc if you think your child might have SEN.
Getting involved with your child's school will help them get the support they need. Let the school know what's going on at home. Tell them what your priorities are for your child and how he or she is doing at home, so that the school can build on this. Either way, you will be involved and your views will be needed throughout the process, and you will be kept up to date with the progress made. Young people aged 16 to 25 will be fully involved in designing their own SEN support and provision. If you're worried about your child's progress or development at school or nursery, talk to their teacher or the special educational needs co-ordinator (SENCO). 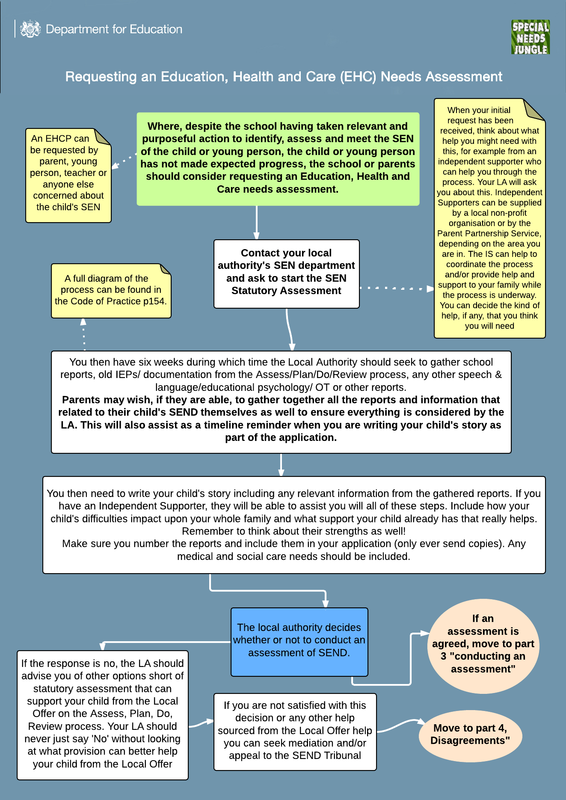 The SENCO can spend some time with your child to work out what kind of extra support they might need. For example, this may be a different way of teaching, or having another adult in the classroom. Every child's SEN needs are different, depending on what kind of difficulties they have and how serious these are. Your child's difficulties must be assessed so that the right support can be provided. The assessment should include, for example, your views, the views of teachers and other professionals who work with your child (such as their teacher), and looking at records and other information. This needs to be reviewed regularly so that the support provided continues to meet your child's needs. That might mean getting advice and further assessment from someone like an educational psychologist, a specialist teacher or a health professional. You and your child's school/nursery etc need to agree the outcomes that the SEN support aims to achieve. In other words, how your child will benefit from any support they get. All those involved, including you, will need to have a say in what kind of support will be provided, and decide a date by which they will review the plan. This is so they can check to see how well the support is working and whether the outcomes have been or are being achieved. Your child's school or nursery will put the planned support into place. The teacher remains responsible for working with your child on a daily basis. However, the SENCO and any support staff or specialist teaching staff involved in providing support should work closely to track your child's progress and check that the support is working. The support your child receives should be reviewed at the time agreed in the plan. You and your child's school (or nursery/childminders) can then decide together if the support is having a positive impact, whether the outcomes have been, or are being, achieved and if or how any changes should be made. If your child doesn't progress with this extra support, the SENCO can organise help from outside the nursery or school, such as speech and language therapy. Your school or other setting can use the local authority's directory of services (known as the "local offer") to see what help is available that may help achieve your child's outcomes.